Two major Interstate 17 bridges in Phoenix were recently repaired using a new carbon-fiber technique developed by a Tucson company. The Arizona Department of Transportation says the repairs focused on bridge girders that were damaged when they were struck by over-height vehicles. Instead of a normal repair method, such as injecting epoxy to rebuild sections of the concrete girders, ADOT wrapped the girders in a strengthening material called Fiber Reinforced Polymer, or FRP — carbon-fiber strips that are coated and strengthened with a reinforcing polymer. 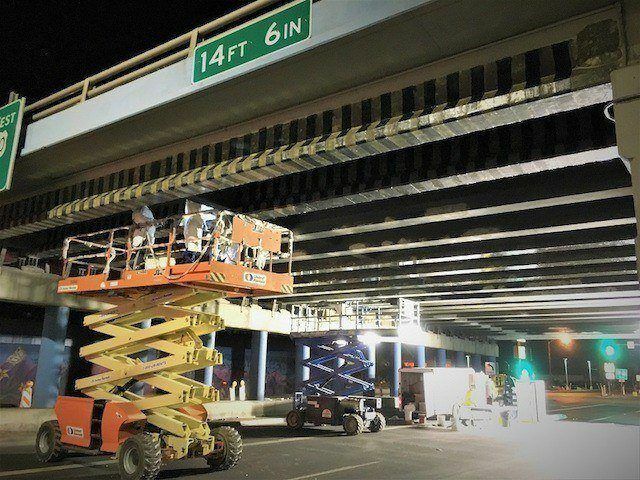 The bridges repaired with FRP carry I-17 over 19th Avenue and Jefferson Street in Phoenix. As a result of the repairs, the 19th Avenue bridge is no longer considered structurally deficient, ADOT says. The Jefferson Street bridge was not structurally deficient. The FRP repair was developed by QuakeWrap Inc., a Tucson company, and was installed by construction firms from Tempe and Tucson. ADOT says the new repair technique can extend structures' life spans and can be completed in much less time than traditional repair methods. Statewide, ADOT says, less than 2 percent of the department's bridges are listed as structurally deficient. But the department says that designation doesn't mean the bridge is unsafe to use — just that an inspection has identified certain repair needs.